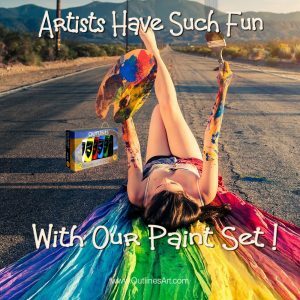 How do you use our paints? We are always delighted to see what you have made and we welcome stories and pictures about people making arts and crafts. Some people simply mess around all by themselves and are sometimes surprised by their results. Others use them to teach or to use in demonstrations, and sometimes groups of people enjoy workshops together to practice their art or craft. Whatever you do and however you incorporate our products we would love to hear about it. If you would like us to feature your project/design/painting just take some photos and tell us all about it. When you write using the form below, we will answer as soon as we can and tell you how to send your photos. Would you like to write for Outlines Art? And similar articles related to subjects discussed on this site. Read Carefully and follow these, or your submission will be discarded without a second glance. Articles should be ready for publication before submission. All submitted articles will be subject to review and may be edited before publication. Work must be original, entertaining and informative. They must be well-written and grammatically correct. They should include a title, sub-headings where relevant and be divided into short paragraphs. 450 words minimum. Articles of over 1000 words may be split to more than one article. Plagiarized articles will not be used under any circumstances, and text will be tested for plagiarism using online tools. Each article must have at least one relevant quality image to accompany the article. Extra images or a short video can be included to illustrate methods if necessary. All images must either belong to the author or be free of all copyright restrictions (CC0*), and can be attributed to the image creator, if supplied. Approved Writers or contributors can display an author’s ‘card’ including a photo of themselves and a short biography or strap-line and will receive a link to their website and a Big Thank You. *CC0 = published under the Creative Commons Licence, Zero restrictions. You can search ‘free images cc0’ to find distributers. Good-Oh – Please contact me with your idea or outline before submitting the piece. If you want to write an article, the subject of your message should be ‘I would like to write for you‘. Please use this form to submit your Idea or Outline.